Threaded screw shank apex adapter extensions from Apex Fastener Tools formally Cooper Tools. Drive extensions form Apex Fastener Tools feature durable construction and a quality design that ensures a long service life. With Apex drive extensions you are assured of high quality and industrial strength. The TH-250 Threaded Screw Shank Apex Brand Adapter Extension is one of thousands of quality tooling products available from MRO Tools. 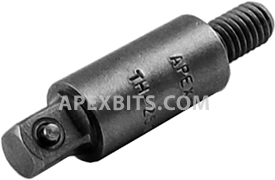 Please browse Apex Threaded Screw Shank Adapter Extensions for tools similar to the TH-250 Threaded Screw Shank Apex Brand Adapter Extension. TH-250 Threaded Screw Shank Apex Brand Adapter Extension description summary: Threaded screw shank Apex brand adapter extensions. Male Square: 1/4'' Male Thread: 1/4''-24 Overall Length(in./mm): 1 5/8''/ 41mm Body Diameter(in./mm): 7/16''/ 11mm Quantity discounts may be available for the TH-250 Threaded Screw Shank Apex Brand Adapter Extension. Please contact MRO Tools for details.